Private Coaching will give you a chance to work one-on-one with one of our trained instructors and are great for golfers of all abilities. Lessons will be tailored to your needs, and are booked to work with your schedule. *All Director of Instruction lesson packages include the use of a FlightScope. Semi-Private and group lessons are for 2-5 players. This is a great way learn the game with your friends in a humorous and relaxing atmosphere. Instruction will be tailored to you groups needs and can be arranged with your schedule in mind. GBC Academy is offering 9 hole playing lessons. 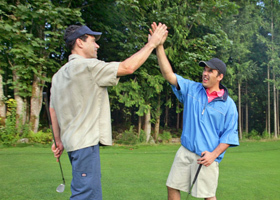 This is a great way for you to learn how to play the game with your own personal caddie. During the playing lesson we will help you with: reading greens, club selection, sand play, uneven lies, weather conditions, and understanding how to play each hole with your game in mind. The price is $250 with maximum of two players.